THE WRITING BUDDHA - Opinions | Books | Movies: It Happens for a Reason by Preeti Shenoy (Book Review- 4.25*/5)!!! 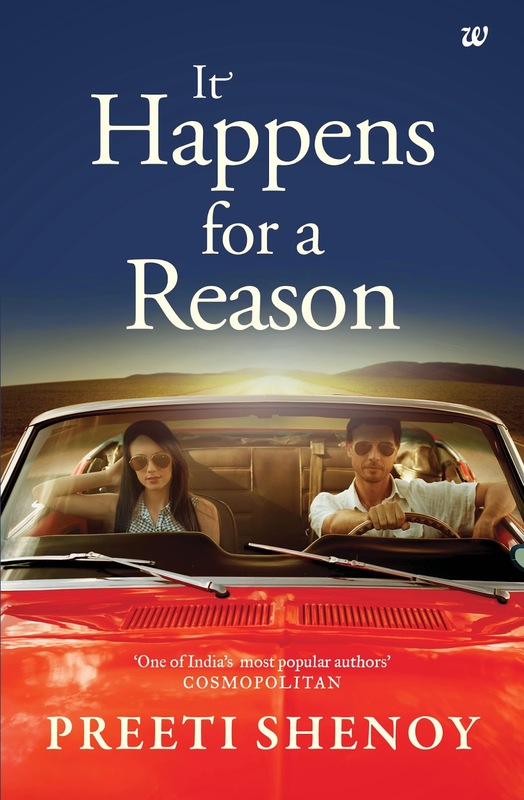 It Happens for a Reason by Preeti Shenoy (Book Review- 4.25*/5)!!! If there's one writer who have always impressed me with his/her writing each time he/she had released his/her work- It's Preeti Shenoy apart from Ravi Subramanian. Not even once did I rate any of her book below 4 stars. In fact, her last book "The One You Cannot Have" got 4.9* rating from me. That's almost perfect. This time, it took me long enough to read her latest book because of internship and college issues. But I finished reading "It Happens For A Reason" few hours ago and since then I am only thinking about its characters and emotional journey through which the book took me. I had plans of sleeping around 12 AM last night but her book made me wake till 4.30 AM. That's the power of Preeti Shenoy's writing and her stories. You just keep getting deep into it and find yourself in a meditative state after a point of time where you are concentrating only on the words written by the writer. With every breathe, you feel the emotion and feelings of protagonist and every other character attached with him/her. IHFAR is a story about a girl who ends up getting pregnant before marriage while her modelling career is at zenith. She takes the decision of giving birth to her child while the boy, Ankush rejects her decision and even her parents decide to send her away from Mumbai. She is fine with all the rejection as the only thing that she wants is her baby. She names him Aryan. From here on wards, Preeti tells us about how she takes care of a 15 year old boy and how she struggles to earn whatever little bit she does. Also her past is been discussed as the emotional turmoil that disturbs Vipasha every day. Suchi is always there with her as moral support since childhood. What happens when one day Ankush returns back in her life? What happens when her parents who dejected her also contacts her? What happens when Aryan comes to know about his father? To find this answer, you will have to experience this roller-coaster ride yourself. Preeti Shenoy once again writes in very fluid English which is surely going to impress the class that thinks Indian authors are only ruining the language and literature. From the point the book starts, the emotions that the protagonist Vipasha expresses makes you feel for her. There are few great scenes in the book which I don't think any other writer could have written it so well. The incident that takes place with the dogs, the love-making scene between Vipasha and Ankush, the final hospital moment when she gives birth to Aryan, the hug scene between the father and son and many more... I loved the equation between Vipasha and Suchi the most. I also liked how the author connects the story with a real incident where 24 children drowned in water in Himachal Pradesh. The last 20-30 pages are so emotional that I found myself controlling my tears every minute. I give this book 4.25*. I want to give it 4.5* or more but because I feel Preeti Shenoy has just repeated herself again and not done something very new. I have already read a story from her where a mother is a single parent to her child and struggles to earn for him. I have already read in another book how a married lady gets back to her teen love/husband. I wished if a new base could have been used for this one but I'm still more than impressed. This book is a soul in itself. And if you haven't read Preeti Shenoy still, you will rate this book no less than 4.75*. Just do read this book. I felt so much love and respect for my mother after reading it. All thanks to Preeti mam for making me get into the shoes of all the women in my life and think about how they think of life. Only you can do this. EACH AND EVERY TIME. RESPECT!